Proprietary Name: Diphenhydramine Hcl And Zinc Acetate What is the Proprietary Name? Non-Proprietary Name: Extra Strength Itch Relief Continuous Spray What is the Non-Proprietary Name? Diphenhydramine Hcl And Zinc Acetate with NDC 36800-126 is a a human over the counter drug product labeled by Topco Associates Llc. 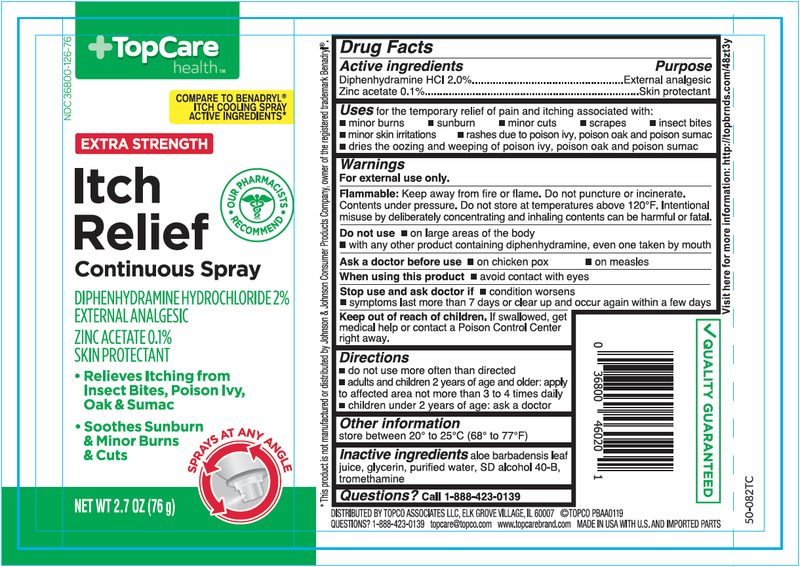 The generic name of Diphenhydramine Hcl And Zinc Acetate is extra strength itch relief continuous spray. The product's dosage form is aerosol, spray and is administered via topical form. Keep away from fire or flame. Do not puncture or incinerate. Contents under pressure. Do not store at temperatures above 120 ºFIntentional misuseby deliberately concentrating and inhaling contents can be harmful or fatal.